Campéole Le Coiroux är en camping i Aubazine, Corrèze, belägen i skogen och vid en sjö/en rekreationsplats. Campingen har platser med stängsel, med skugga, utan skugga och platser med lite skugga. Campéole Le Coiroux ligger i närheten av en sandstrand. Det finns möjlighet att hyra husbilar och bungalows. På campingen finns en lekplats och ett sportområde. För den sportige semestervandraren har campingen utflyktsprogram, guidade vandringsturer och olika cykelleder. Det finns ett underhållning. Campingen förfogar över en utomhusbassäng och ett knattebad. I den närliggande omgivningen kan du också simma i en sjö/rekreationspool. Denna inspektör gör varje år ett besök på Campéole Le Coiroux och inspekterar campingen för ca 200 faciliteter och för andra förekommande punkter. Inspektören är en medarbetare från ACSI och arbetar inte för campingen. Shower/Toilet facilities were excellent, clean with plenty of hot water. Staff at reception were very friendly and spoke good English. This is a large campsite with good sized pitches and seemed to work on the premise that once on site to keep you on site since it provided most necessities-but only in the high season since they were all, with the exception of the swimming pool, closed I have no complaints about the site but I did find the route to it and the site itself a bit too remote for my liking. What a great site, very close to a lake, a few minutes walk, dogs loved to swim every day, then back at the site there is a dog shower cubicle. Site facilities are the cleanest we have ever seen, good hot roomy showers with a sink as well. Staff very friendly and helpful, good large pitches, swimming pool although not covered was heated and very good will be going back. Do not be put off by the hairpin bends on the way up the road is good and we accessed it with a 7.5m unit and a tow car. Very Beautifull campsite, quiet with lovely surroundings. Nice and clean Toilet facilities, nice pool. Could have more light in the access to the pitches. We´ve been only one night but we loved. A campsite to visit again. This campsite is excellent. The staff were helpful and would certainly suit a family with children as there is an adventure ground just outside the site with zip wires, rope walks etc which children will love. Very good walks round the nearby lake with a beach area. Lovely pool and good small children play area. They were even building a youth meeting building which seems a great idea. The toilet complex was excellent except for one thing: the water for the showers and washing up were at best tepid. A shame because it was exceptionally clean with very good facilities. A really excellent site, just a shame about the tepid water. Very good site and excellent value for money in low season. Large pitches, very good sanitary block, well laid out for tourers, but could feel as though touring side of things is the second string to the bow as there are so many cottages and other static accommodations. Well placed near lake and golf. Site picture of village is misleading as is some distance away! Otherwise a very good site. Quiet out of season, plenty of good size pitches available. Very clean facilities but water luke warm. Shop and restaurant closed in low season although bread was available from reception. Pool was good but suspect it would be crowded in high season. Nearest village was Aubazine (5 Km) and nearest supmarket was in Brive (11Km). Good golf course 1 Km away (51 euros for two on a weekday. Hilly course but very scenic. Lovely lake with beach close by (fishing and swimming). Free wifi on site. Good value site in low season. Motorhomes should stock up with food before arriving. very twisty road to get to the site. Vill du boka campingen Campéole Le Coiroux eller få mera information? Det går bra med nedanstående uppgifter eller via campingens webbsida. 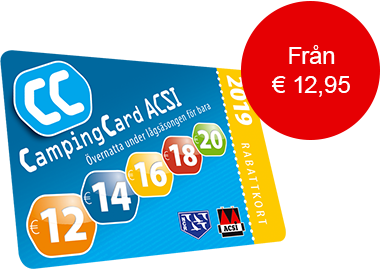 ACSI Eurocampings skickar din informationsförfrågan till "Campéole Le Coiroux".